Katrina has one goal—follow through on her late-grandmother’s last request, to oversee the renovation of Katrina’s childhood home. The handsome contractor is distracting, but she refuses to be swayed by his deep brown eyes and broad shoulders. A summer romance is not part of the plan. When the truth is discovered about her family’s past, Katrina fears her own future is in jeopardy. 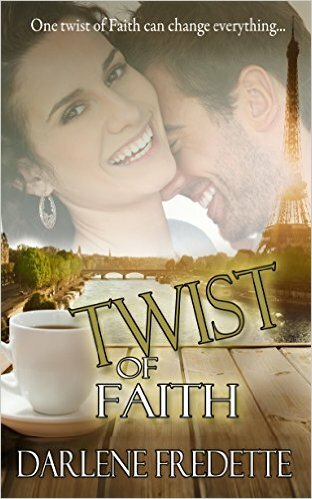 She doesn’t have faith, but the twists that lie ahead may just change her mind. Nick refuses to accept help from anyone, until Katrina gives him an ultimatum—one he can’t refuse. Her renovation project will save his business, but puts his heart on the line. Can he convince Katrina to stay or will a promise to her late-grandmother pull her away? With a little twist of Faith, the odds may be in his favor. Most people dream about being swept off their feet. Nick did just that for Katrina — LITERALLY. He saved her from harm in a construction zone. He then, not so politely, informed her about the importance about proper work attire — aka a hard hat which BTW he bestowed upon her as a gift later on. Sweet and surprisingly romantic gesture. He continued to be quite the sweet, loving man even after encountering a bombshell regarding Katrina. Heck, he stood by her while she was dealing with a life changer of her own. An all their ups and downs wouldn’t have been possible without dear ole’ Gram. A woman with a heart of gold but harboring life-altering secrets of her own. An avid reader since childhood, Darlene loves to develop the stories swimming in her head. Following a career path in administration, she excelled in the art of editing and design, which eventually led to a position as Director of Administration and Marketing. Now, making her dream come true to write full time, Darlene writes heartwarming contemporary romances with a focus on plot-driven page-turners. Darlene resides on the East Coast of Canada with her husband, daughter, and Yellow Lab. When not working on her next book, she enjoys spending time with her family. I think I have this book in my TBR list already!!!! Thank you, Kameron, for the wonderful review, which made my day! You're welcome back here anytime.